Sarah Grant talks to Sean Getzwiller about his path to victory in such a huge field. Congratulations to Sean Getzwiller, Winner of Event #8: $1,000 No-Limit Holdem ($611,185)! 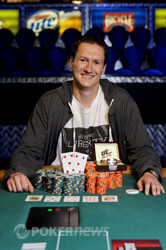 After four days of battle over five calender days, the 2011 World Series of Poker now has an Event #8: $1,000 No-Limit Holdem Champion with Sean Getzwiller victorious! Kicking off over the weekend with two day one starting flights, 4,178 players took to the felt to form a prizepool of $3,760,200 which saw 423 players head home with their wallets or purses a little heavier in cash. Although branded by players and poker media as the donkament that features amateurs with only a few hours on the felt along with seasoned veterans and online professionals who have logged millions of hours - it still takes some skill and combined run good to make it deep. Players such as Valdemar Kwaysser (420th), Jason Koon (412th), Dan Heimiller (392nd), Kyle Bowker (389th), Sam Barnhart (385th), Bryn Kenney (280th), Marc Karam (270th), Allie Prescott (221st), Gavin Griffin (215th), Kathy Liebert (204th), Alexander Kravchenko (177th), Ylon Schwartz (174th), Layne Flack (95th), Jonathan Duhamel (54th), Young Phan (52nd), Eric Mizrachi (50th), Ana Marquez (32nd), Albert Kim (31st), David Peters (29th) and Jordan “Jymaster11” Young (19th) all managed to turn on their run-good switch at the right time, but it still didn't secure them a place on our final table. Those fortunate nine would all be moved to the bright lights of the Thunder-Dome where they would battle back-and-forth trading blows as one-by-one they fell to the rail until just six remained and the now well-known card controversy was uncovered. With a manufacturing fault on some of the cards, but on all the , the final six were moved to an outer table where the muck wasn't visible due to the lack of bright lights. From their play stalled until the final few hands where play was reduced to three-handed play, and action was paused for the night. Returning today saw Jon "PearlJammer" Turner chasing vindication as long-time professional, but his run would end early when his pocket eights were cracked. With Sean Getzwiller and Sadan Turker virtually even in chips, the two would fight one of the most brutal heads-up battles that would last nearly six hours! A never-ending run of lead changes mixed with double-after-double saw the two players look physically distraught at every bad beat and lucky card their opponent caught. Eventually it would be Las Vegas-based professional Getzwiller who would get the better of Turker as he denied the British a third bracelet within just a few days. For Getzwiller, this marks his ninth WSOP cash and now has a hundred-percent strike-rate from final tables after dispatching opponent-after-opponent on his way to standing atop the 4,178-player field. Getzwiller not only showed bouts of aggression, but also key timing in important pots as well as combining that with huge and gutsy calls. 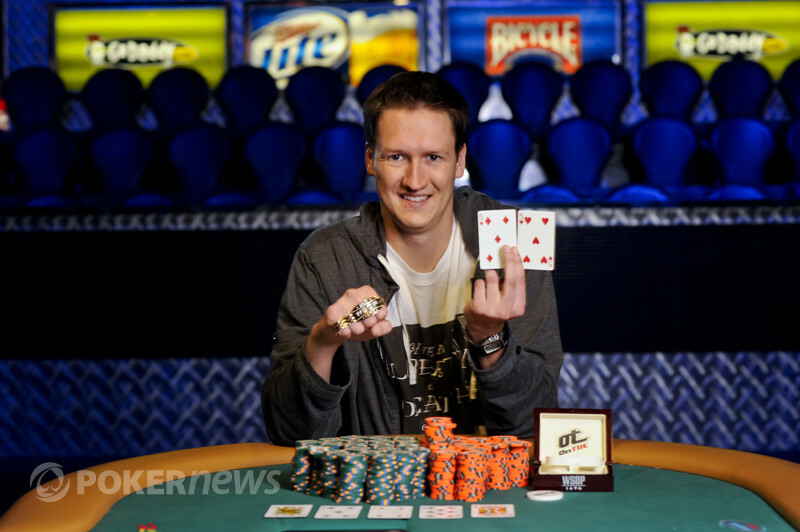 PokerNews is happy to congratulate Sean Getzwiller on an excellently played tournament that saw him handle the vicious heads-up battle to be awarded the coveted gold bracelet, $611,185 in prizemoney as well as title of Event #8: $1,000 No-Limit Holdem Champion! Sadan Turker Eliminated in 2nd Place ($377,411); Sean Getzwiller Wins! After a see-sawing heads up battle which saw both players battle the short and big stacks, it was inevitable that at one point someone was going to hold in a coinflip. On this occasion we saw Sadan Turker ship for just under 4 million as Sean Getzwiller made the quick call. With Getzwiller holding both the chip and hand advantage, both rails rallied hard cheering for numerous cards such as the ace, nine or five. The dealer spread out the flop, and when it was in full light, it read to give Getzwiller middle set and leave his opponent Turker outs to only runner-runner. As Getzwiller shot up with joy and turned to his rail to celebrate, he remembered that poker can often be a cruel game, and quickly spun round to return to the table to sweat any gut-churning runner-runner combos that could see this gold bracelet slip easily from his jungle-man like grip. With Turker needing a three or deuce to retain any chance in this brutal heads-up match, the dealer would plank the on the turn to end this London-locals dreams of becoming the third Brit in a few days to take home the gold. The dealer placed the meaningless on the river, and as Turker stood up vacated his seat, Getzwiller rushed over from his railbirds to congratulate Turker on a sensationally well played tournament that saw him collect $377,411 in prizemoney. Sean Getzwiller moved all in from the button and Sadan Turker made the call for his 1,910,000 in chips. 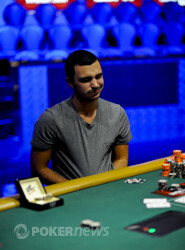 Sadan Turker has picked up even more chips courtesy of four back-to-back hands. Firstly he received a walk, then shoved from the button before finding another walk. The fourth hand saw him shove all in and force a fold from Sean Getzwiller. Sadan Turker pushed from the button and Sean Getzwiller folded his . Turker flashed his and collected the pot. In the very next hand after his massive double-up, Sean Getzwiller looked to finish off Sadan Turker by pushing all-in with his . He knew Turker was calling with his extreme short stack, but was surprised to see his opponent held a made hand with the . The flop of gave Getzwiller more ways to win the pot and his first WSOP bracelet, and he could now catch any ten, six, or king in the deck. The turn card was the and Getzwiller picked up even more outs, as now any nine would also complete his double belly buster straight draw. His rail began cheering for tens, sixes, kings, nines, anything to give their man the victory in this hotly contested heads-up duel. Getzwiller struck out and Turker doubled up to just over 1,100,000, with the famous chip-and-a-chair mantra now in full effect. In a heads-up contest that has quickly devolved into a preflop shove fest, Sean Getzwiller and Sadan Turker again got all the chips in the middle before the flop. Turker raised to 450,000 from the button, Getzwiller three-bet shoved and Turker instantly called. Starting with nearly equal stacks, the winner of this all-in confrontation would claim a stack of over 10,000,000 chips for a massive lead. The classic race situation was on and both players stood to watch the dealer burn and turn. The door card was a beautiful king for Turker and he must have thought he had it locked up, but a ten was lurking just beneath it to dash his hopes. Getzwiller had flopped a set to leave Turker drawing extremely thin. Only a runner-runner combination to a straight would save Turker now. No miracles were forthcoming and Getzwiller had scored the massive double up, giving him a stack of 11,600,000 and leaving Turker crippled with only 750,000.